Offering you a complete choice of products which include 20 mm drain cell, drainage cell, drain cell, 50mm drainage cell, 25mm drainage cell and 30 mm drain cell. To meet divergent demands of the clients in an efficient manner; we bring forth an exclusive range of Drainage Cell. These are widely used in planter box and roof garden applications for promoting plant growth. The offered product is designed with superior quality components, using the latest cut edge technology under the supervision of adroit professionals to meet the essential needs of the clients. Furthermore, the given product is quality checked on different parameters to meet the standards set by the industry. Strongest and best clip product in the market. Being a reputed name in this domain, we are passionately dedicated to offering a comprehensive array of Drain Cell. Available with us in variegated specifications; the given product is widely demanded and appreciated due to its compact design, easy maintenance, and high durability. The product is designed with precision by using best quality components and employing ultra-modern technology under the strict vigilance of our dexterous professionals. Additionally, clients can get these at nominal rates. 50mm Eco-RainwaterSolutions Drainage Cells or Grass or Gravel Porous Pavers Eco-Rainwater® 50mm Drainage Cell is a plastic cell structure designed for the creation of permeable grass/gravel areas subject to pedestrian and vehicular traffic, it is lightweight, easy to install and with excellent high strength interlocking system. The cell structure provides high load bearing capacity and real containment of soil mix / gravel to create a permeable surface, due to its unique three dimensional design, it can withstand heavy traffic for parking lots without traditional problems associated with permeable paving such as overheating and compaction of the root zone. The system can be used for storage, dispersion of cold or heat, reducing hydrostatic pressure for high water table and for filtration of rainwater as well as filled grass or gravel as porous pavers. We Vikas Industries are Manufacturers, Exporters & Leading Suppliers of Drainage Cell Loacated in Andheri, Mumbai, India. Very high compressive load bearing capacity. Easy to store and install and comes in preclipped panels. Also available in Virgin Material if required. Light weight and easy to install no need for heavy machinery or skilled labour. 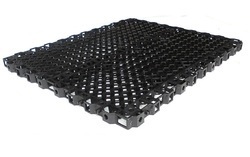 Creates permeable surface and reduces heat or cold. Reduces Stormwater runoff rate if used as permeable grass or gravel pavers. Eco-Rainwater® Drainage Cell System provides a perfect solution for a sub soil drainage application also for creating a successful Roof Garden. The 25mm Eco-Rainwater® Drainage Cells provides a uniform surface as well as an internal void space for effective draining of excess water for vertical or horizontal applications. 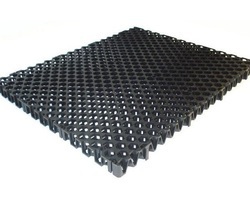 The EcoRain/Eco-Rainwater® 25mm Drainage Cells is made from recycled or VIRGIN Polypropylene that is inert to soil borne chemicals and bacteria. 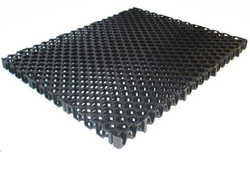 These cells have a shallow and effective drainage profile and ensures landscapers can make full use of mature plants on roof gardens that needs soil depth and water retention properties. 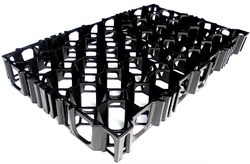 The 25mm Eco-Rainwater® Drainage Cell system has a unique octagonal design structure which provides water retention for passive irrigation and helps building a perch water table in the above soil profile for the vegetation to flourish in prolonged dry periods. Very high compressive load carrying capacity. 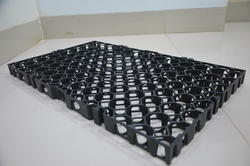 Light weight +/- 2.5 kg/sqm compared to 250 +kgs/sqm of gravel for the same effective drainage and can reduce slab loads.